Born in Syðrugøta on the Faroe Islands, but now residing in Copenhagen, Eivør has been making music for most of her life, indeed her first album was released when she was just sixteen years old, blending traditional Faroese with other contemporary sounds. Eivør has stated that she wants her music to evoke the dramatic landscape of her Nordic homeland, which can be both harsh but beautiful and gentle. She tries to blend that wildness and softness together and, in my opinion, succeeds with these moods in a most wonderful way. Eivør’s voice is what drew me to this review; she has a vocal identity of her own, a wonderful range which can be ethereal with an almost breathless loveliness, and yet she can be most powerful, at times reminiscent of early Kate Bush. Listening to this album it occurred to me that her voice seemed familiar and I have since discovered that she provided the title music for the BBC/Netflix series The Last Kingdom. 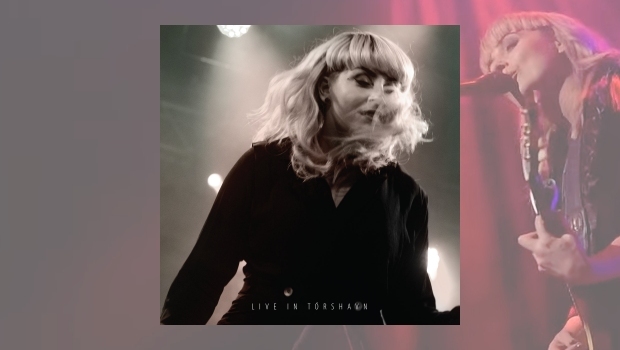 This live recording sees Eivør present her music with a band of utmost quality, demonstrating a dedication to the music that shines throughout the whole album. It is an innovative presentation of sounds and melodies which creates an emotive and atmospheric feel. It is ethereal, beautiful and moving with a mesmerising power to the performances, both instrumentally and vocally. Despite this being a live album the audience is kept to a minimum, which helps the listener focus on the music – no loud voices at the bar here! The songs are sung in her native language, but also in English and this mix adds to the mood, delivering a captivating experience. The music evokes an emotional response from the listener with its ever-shifting changes of mood; it all goes to underline what a very talented songwriter Eivør is, and her work needs to be more widely heard. The album gets off to a beautiful start, with Mjørkaflókar which has a gentle, atmospheric and almost electronic feel, her native language adding to the mystique. The pace is more upbeat for the second track, Brotin. Here there is an upfront bass line to start, reminiscent of Mark Sandman (Morphine), accompanied by a very interesting drum pattern, before the bass shifts in style as its previous position is taken over by guitar. For Salt the mood shifts again, it’s a more primal, even darker piece which drifts into what appears to be heavy electronica, again this grabbing your attention. Things change again for Bridges, a beautifully emotional piece of song writing with some thought provoking lyrics. This album is a clear band effort providing a memorable experience, but Eivør goes solo on Trøllabundin, with just hand drum and voice, demonstrating her skills and the astonishing range in her voice, in what is an amazing, primal piece. The few tracks I have selected mention just some of the highlights, and a fraction of the experience contained across the seventy four minutes of this album. The time passes so quickly, and left me with a musical and emotional contentment. I would like to say, “Tusen Takk Eivør!”. This is a wonderful album, and in me you have a new fan. I hope this review can help spread the word, Live In Tórshavn needs to be heard folks, as I am sure many of you would love to own it when you discover the delights contained within.